Kederekt Parasite, only works if you have a red permanent (Artifact, Enchantment, Creature or Planeswalker), you don't have any. Your playing in a similar space to Owling Mine (Ebony Owl Netsuke) decks, but wanting to leverage discard, so Gnat Miser might make more sense as a 1 drop creature. 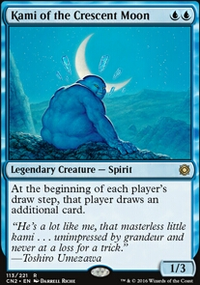 There are a couple of 3 drop creatures which are worth considering too Master of the Feast and Adamaro, First to Desire. Lastly here are a couple of spells that cause hand discard and draw; Reforge the Soul and Wheel of Fate and one that plays well with Burning Inquiry if you keep it Runeflare Trap. Hope this helps, good luck with your brew. Darth_Savage on Friends? I have no Friends. Geralf_Cecani, already made the case for adding blue or green, I'm going to make a case for black or staying in mono white. First off black actually has a straight up fog Darkness, splashing black also lets you use Batwing Brume to its full extent and the obvious Lingering Souls. Plansewalker wise you would have access to Sorin, Lord of Innistrad and Sorin, Grim Nemesis, both are pretty reasonable and more budget friendly than most. Note too that a new BE planeswalker is due for release with the next set. Lastly, your card draw choices remind me of Owl-ing Mine, this deck uses Ebony Owl Netsuke to deal it's damage and cards like Boomerang and Remand to stall your opponents board. Again this isn't strictly my idea, as I got it from DaFerra's deck Owl-ing Mine. I went away, went on a Solstice vigil, and in the middle of the night had a revelation on how I would play it. I still stand by Isochron Scepter, but it doesn't address the problem you named of actually winning. But your hand is emptying out much faster than theirs. Khorvath's Fury draws you a card and deals seven damage to them Black Vise is almost guaranteed to do three every turn. 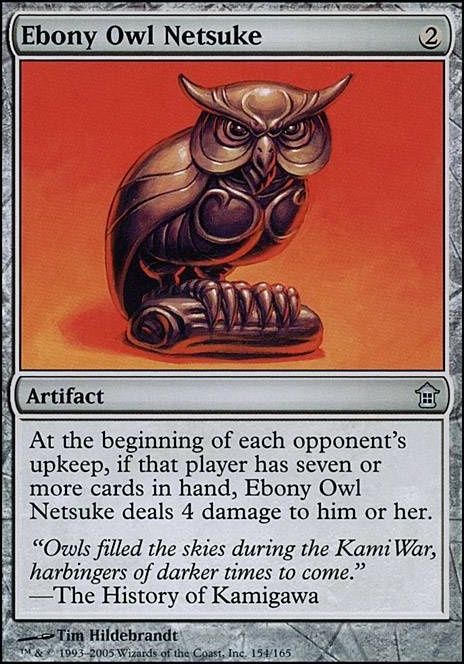 and Ebony Owl Netsuke is doing a solid four each turn. Molten Psyche does seven or more! Back to Basics. Will absolutely destroy some decks and is a mainboard option. Since you're mostly basic Islands, you're unaffected and can build a soft lock before committing to Stasis. I also agree that you probably want Black Vise over Ebony Owl Netsuke. 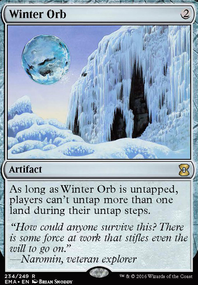 There's also no reason to not be playing Force of Will in your mono-blue control deck. This will help immensely if your opponent tries to do something tricky, like resolve a Stoneforge Mystic that's going to grab Batterskull or casting Liliana of the Veil. Jace, the Mind Sculptor can also be a secondary win condition, in addition to making sure you have plenty of cards and bouncing any creatures that manage to sneak in via Aether Vial. Probably the derpiest card for Stasis is As Foretold. Like, I don't think your opponent can actually win if you resolve both. You will be able to cast Counterspells with impunity, while never having to tap an Island except to pay for Stasis. Lastly, Meditate, Chrome Mox, and Lotus Petal are all good options. Meditate fills a similar role to Chronatog, but helps you find more answers and threats. Chrome Mox and Lotus Petal allow you to go "SURPRISE, NERDS! Turn 1 Stasis on the draw!" or even turning out an early As Foretold. 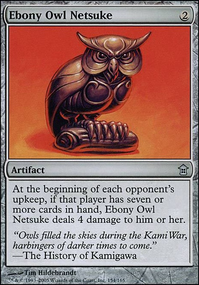 You probably don't want Dark Deal and Ebony Owl Netsuke in the same deck. Now, I'm not opposed to number 3 being a red/blue land, if you're going to include Gaze of Adamaro, Ebony Owl Netsuke and Eye of Nowhere type effects in your set (it's happened before). 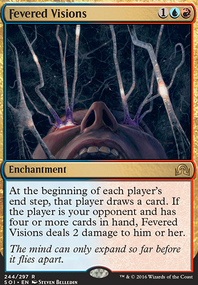 You could also make the cycle have the different color lands have different abilities.